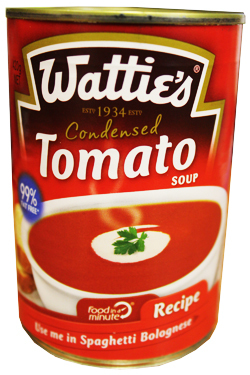 For generations of kiwis tomato soup has been a favourite. This soup is convenient, as well as being delicious and healthy for the whole family. Simply add water or milk for a creamier soup, or try using in a Bolognese? Tomato Puree (91%), Sugar, Salt, Maize Flour, Maize Thickener (E1412), Butter (Milk), Acidity Regulator (Sodium Bicarbonate), Spices, Natural Flavour.